Falscher hase came into prominence after World War II when meat was still scarce but German housewives wanted to put a special dish on the Sunday table. Ingenious cooks, they mixed together chopped meats, wrapped them around hard-cooked eggs, shaped the mixture into a meatloaf reminiscent of a rabbit (a highly prized meat in Germany) and "roasted" it. Bacon ​or speck spikes the flavor, as does parsley, mustard, Hungarian paprika, and sour cream. In a large bowl, thoroughly mix together the meat, onion, 3 tablespoons of the breadcrumbs, the 2 raw eggs, salt, pepper, paprika, mustard, and parsley. Sprinkle the rest of the breadcrumbs on a cutting board and flatten the meat mixture into a rectangle about 1 inch thick. Arrange the whole, hard-cooked eggs in a row down the middle. Fold the sides of the meat patty over the eggs. Form the meat into a nice, free-form loaf shape. Coat liberally with breadcrumbs. Chop 2 strips of bacon into small pieces and brown in a Dutch oven on the stove. Remove bacon pieces and set aside. Brown the meatloaf on all sides in the bacon grease. Lay the remaining strips of bacon over the meatloaf, pour 1/2 cup beef broth into the pan and place the Dutch oven in the heated oven. Bake, basting occasionally with the remaining 1/2 cup broth for about 45 minutes. 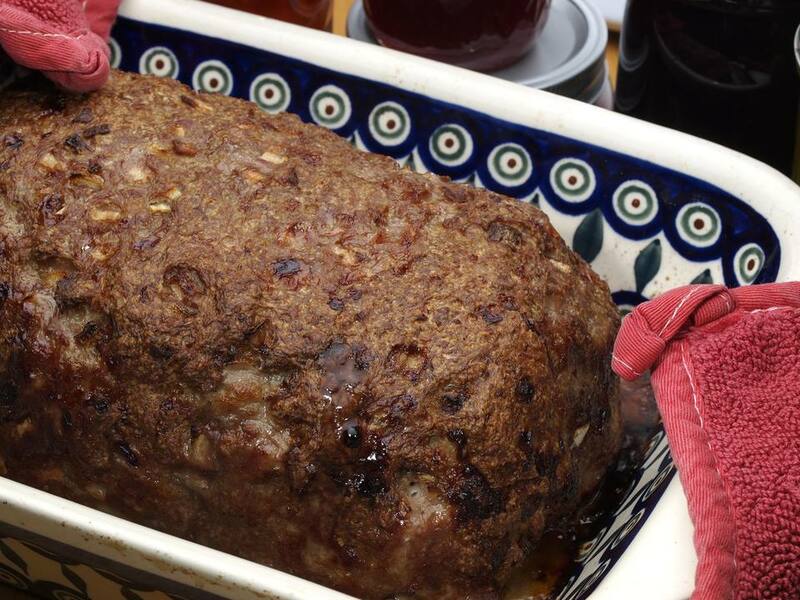 Remove meatloaf to a serving platter, cover with aluminum foil and keep warm. Place Dutch oven back on stove top and add 1/4 cup of hot water. Scrape all browned bits from the bottom of the pan. Mix cornstarch with 1/4 cup cold water and add to pan. Bring just to a boil, reduce heat and stir in sour cream. Try not to boil after the sour cream has been added. Season with optional pepper and reserved bacon bits. Taste before adding more salt. Serve meatloaf with boiled, parsley potatoes, and steamed green beans.